TheGem is a sophisticated and elegant, professional and robustly built, modern and tech-savvy, rapidly responsive WordPress creative multipurpose website theme. 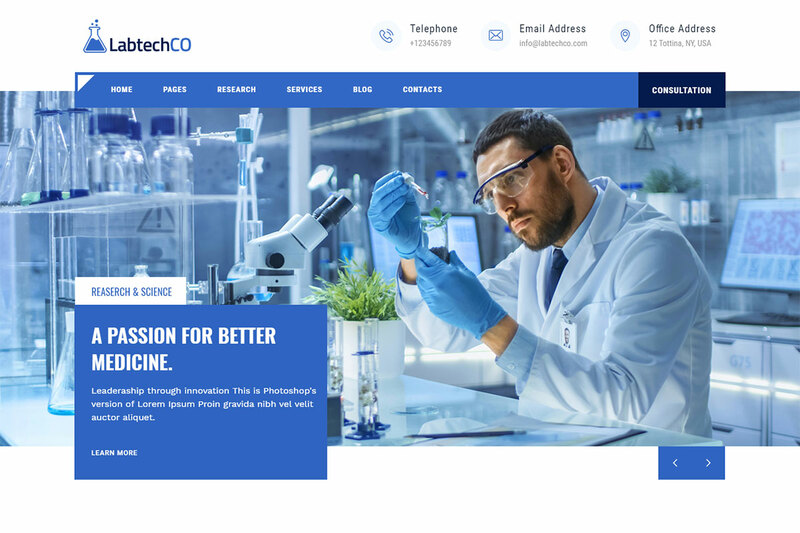 This theme is a reliable engine for the uncomplicated development of powerful, resourceful websites in a number of different businesses and industries with equal proficiency and always at a high standard of performance. TheGem is intuitive to customize and make your own, incorporating potent advanced theme settings as well as the premium Visual Composer drag and drop page builder for you to thoroughly shape and style the look and feel of your website without writing a single line of code. 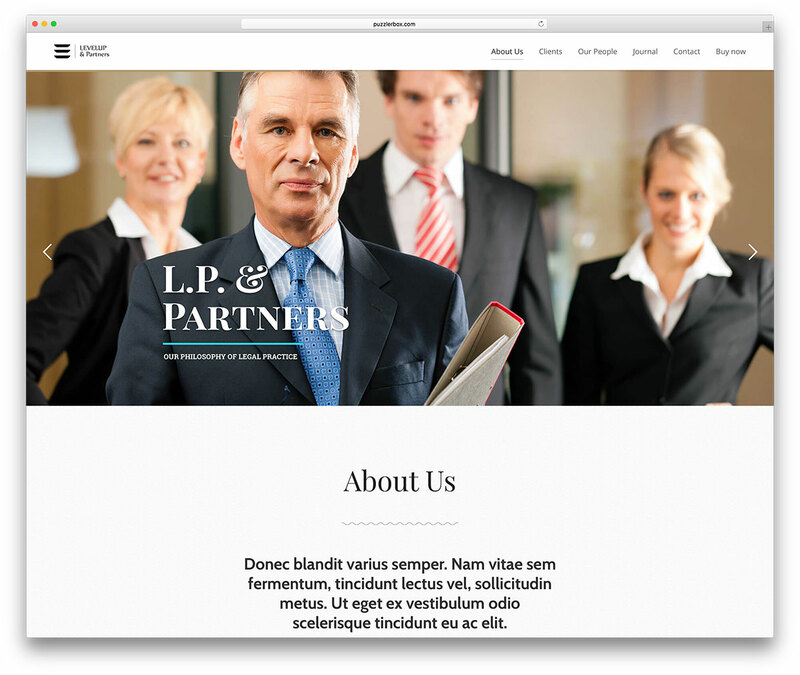 Miako is a professional WordPress theme specially designed for lawyers. It is an effective response to a highly demanding niche. Play around with 12 homepages from multiple or one-page formats and stunning add-ons. Miako is 100% responsive, meaning; it is adaptable to screens and browsers. It has the best functionality enhanced with SEO and Redux framework. Translation, support and updates are also given. Miako is made to think and absorbed environments to reflect on your site. Layout options take this into consideration to support you in portraying your service and reputation. Display your services offered as a professional or a firm with ‘about us’ and ‘team’ pages. Even slides to make galleries as testimony of your success can be easily created. You will get third party plugin integration for Visual Composer and Layer Slider. Get your empire on the rise! Choose Miako! Lawyers, attorneys and legal firms, Attorna is one of the best solutions to get your business online and spread the word out. 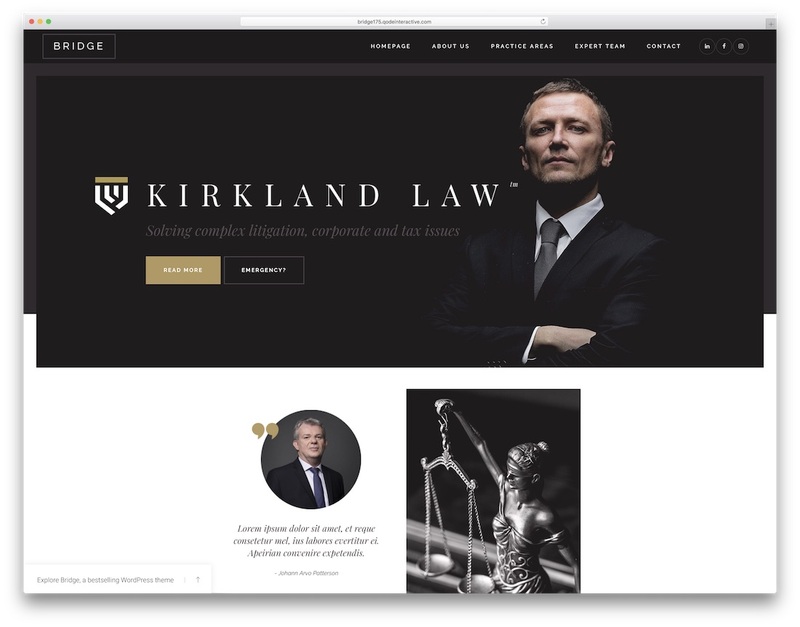 This lawyer WordPress theme delivers a modern, elegant and sophisticated web design that will boost your professionalism to an entirely new degree. You can choose between two multi- and one single-page demos and go from there. Additionally, Attorna also includes several internal layouts for your convenience. Nope, no need to create anything from the ground up anymore. Moreover, Attorna comes with GoodLayers drag and drop page builder to turn everyone into a pro website builder even if creating his or her first page. Some extra features and functions of Attorna are nineteen headers, Revolution Slider, automatic updates, color picker, coming soon page and floating navigation. What’s more, you can freely improve and enhance Attorna with your creative touches until it matches your branding precisely. If you are looking for the best lawyer WordPress theme, you came to the right place. Meet Revolution. It is a multi-purpose theme with all the necessary elements and a horde more to take care of all your plans, needs and requirements. In short space of time, you can hammer out the exact website for lawyers and attorneys and get the word out there. Even if you are a professional individual, you can do all the work entirely by yourself since Revolution is easy to use and even simpler to customize. However, in the bundle of 24 predesigned demos, you will discover one dedicated to law businesses in every respect. It comes with a full-width banner, on scroll animations, fabulous cases pages and a working contact form with Google Maps. Now is your chance to tell more about you and your process, what you excel at and introduce folks to your incredible team. No stopping, jump in with both feet and let Revolution sort out your internet presence. 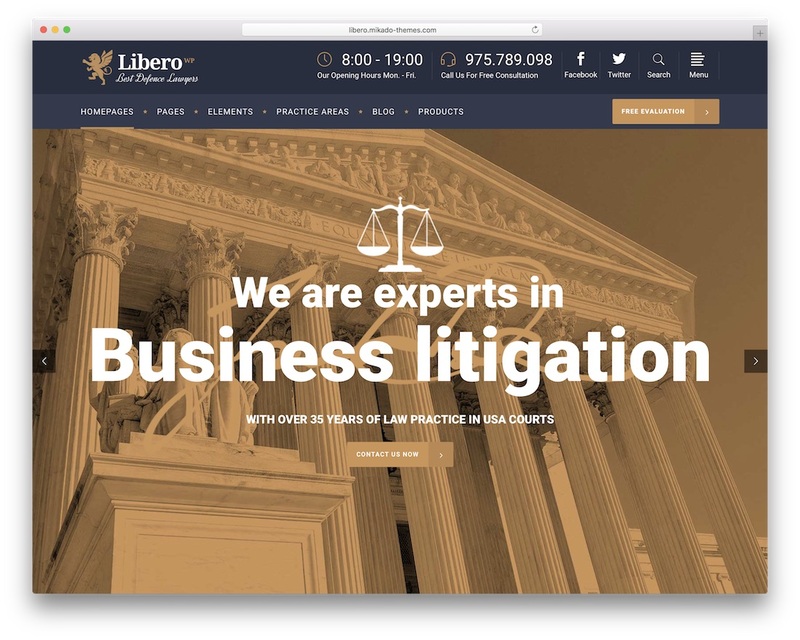 For lawyers and law firms, Libero is one of the best WordPress themes you can get your hands on. It is stuffed with seven sophisticated home pages and twenty practical and convenient inner pages. Every element and every section of Libero is also entirely customizable for you to alter it according to your needs and regulations. No need to stick with the out of the box version when you can enrich the look with your signature style and make it your own. Libero is 100% mobile-ready what makes sure that your law and legal-based websites work and adjust instantly to all devices, from smartphones and up to desktops. There is no need to make a page from scratch anymore even if it means creating a lawyer page, pick Libero and all the rest becomes history. You is a robust and reliable, safe and secure, professional and tidy, extremely responsive WordPress multipurpose website theme. This theme is a sleek and very streamlined website building toolkit, an integrated design experience that requires no coding in order to craft professional quality websites. You has been equipped with a carefully selected group of premium plugins and custom developed resources and shortcodes to massively simplify the website building process, and is packed alongside with ten unique, helpful demo websites to get you started off on the right foot. Lawyers, attorneys and law firms, do you have your website screaming with professionalism and expertness? If you think you could do better with your page, chances are, you are right. 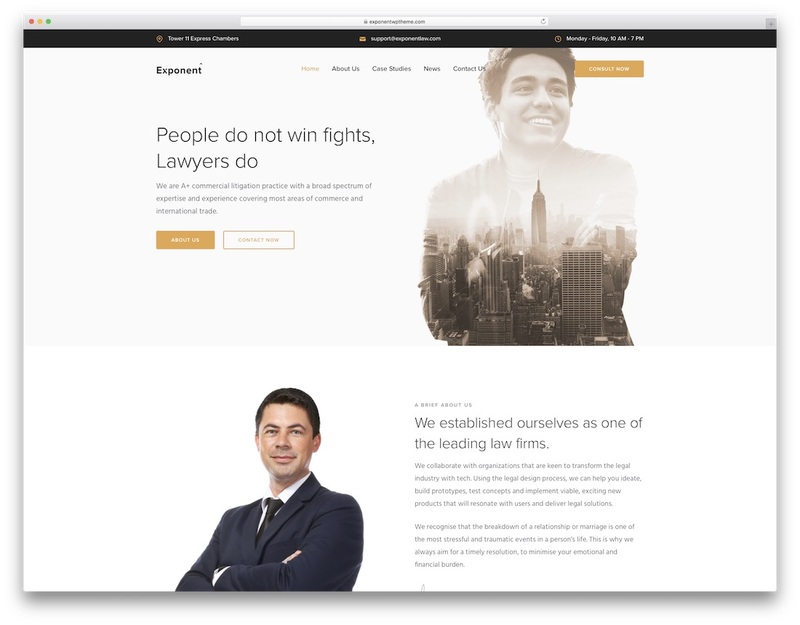 Do yourself a favor and pick Exponent, an extraordinary lawyer WordPress theme that will save you time and energy. As a result, you will craft a spectacular website that will push your services and put your must-see case studies on display. The features of Exponent are highly beneficial, readily available for you to put them to use. The practical visual editor skips coding and turns any user in a pro instantly. Even when it comes to adjusting header and footer, you do it all visually. You can also translate Exponent to any language you want and localize the experience. Exponent is a full-blown solution for your law firm’s web space that is for sure. For lawyers, attorneys, legal firms and other businesses related to the field, Bridge is the one tool that you need. 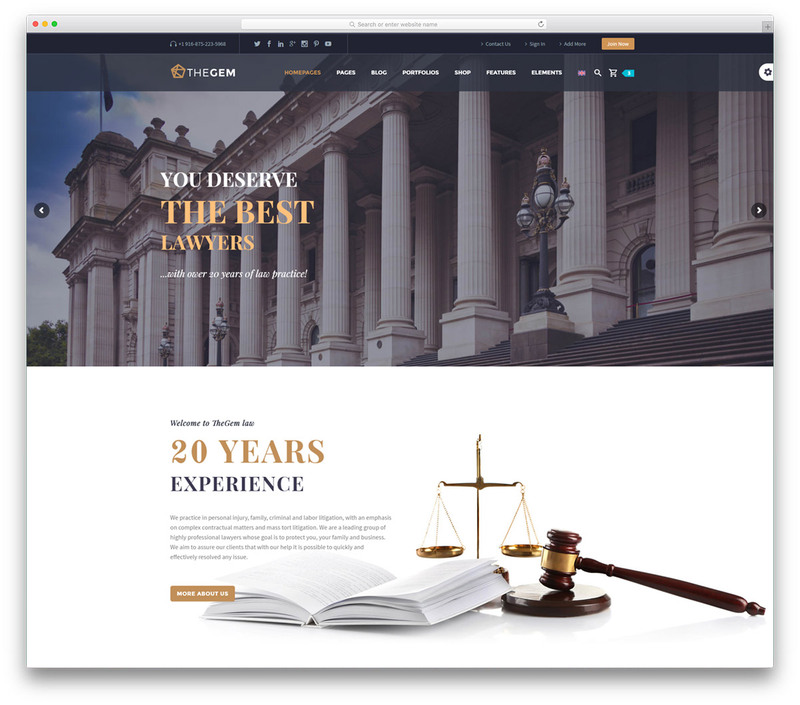 It is a lawyer WordPress theme with three dedicated demos that will sort you out with a complete and fully functional website sooner rather than later. Bear in mind, you do not really need to be an expert at building a website to get creative and innovative with Bridge. Anyone can do it, even if you have never established a page in your life. Bridge has a big bundle of practical features that will get you rolling right away. After you import the desired sample with a simple click, you can already start adding your content and tell the world why your law services are the best. Share testimonials, present in-depth case studies and offer them to book a consulting call with you straight from your website, it is all possible with the mighty Bridge. Handel is an incredible multipurpose WordPress theme. It comes with multiple demos oriented to different professional areas. It serves large scale companies or small start ups equally. One of Handel’s special trades, is its lawyer demo. You will get provided with specialized sections to display your type of services. Make staff pages and an about us section on footer too. Handle is focused on tons of visual appeal as it is made for business users. It has CSS3 animations, Slider Revolution integration and retina ready image quality. Galleries for photos and videos and customizable backgrounds are also offered. You will even find premium icons and fonts from Font Awesome and Google Fonts. Handle has special business features like charts, cost calculators, FAQ sections. Set staff pages and custom sidebars too. It will stand out from others with fully packed testimony sections. Lawyers will be thrilled with its unlimited portfolio and blog pages. You will also find awesome custom posts and social media sharing. Handel has a flexible layout that makes it adapt to any given environment. Screens and browsers are not a limitation especially with its MegaMenu. 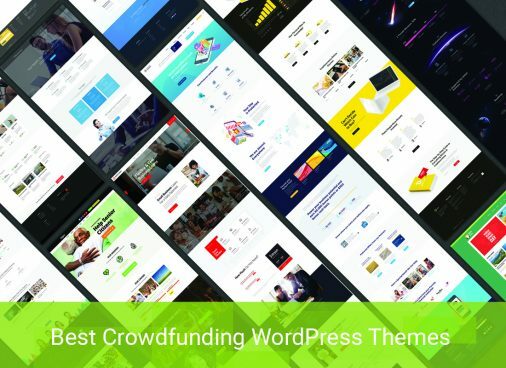 Have a look and confirm the power this theme will allow you to expand your firm! Use Handel lawyer! Etalon is a multi-concept WordPress theme, perfect for business professionals. Lawyers and firms can find in Etalon the ideal site. Thus it is the best demo tailored to the needs of lawyers. Etalon offers specialized trades such as business profiles, team members and opening hours. You can display your business info and contact details. Custom tabs that feature a flexible interface and pricing tables are also available. Etalon is focused on portraying your services neat and clear. You will get icon boxes, and content carousel allows you to show what you offer in a very interactive way. Testimonials, sliding box and FAQ accordion are other unique features available. Etalon includes expensive premium plugins for free. Like Visual Composer that reduces development effort time. 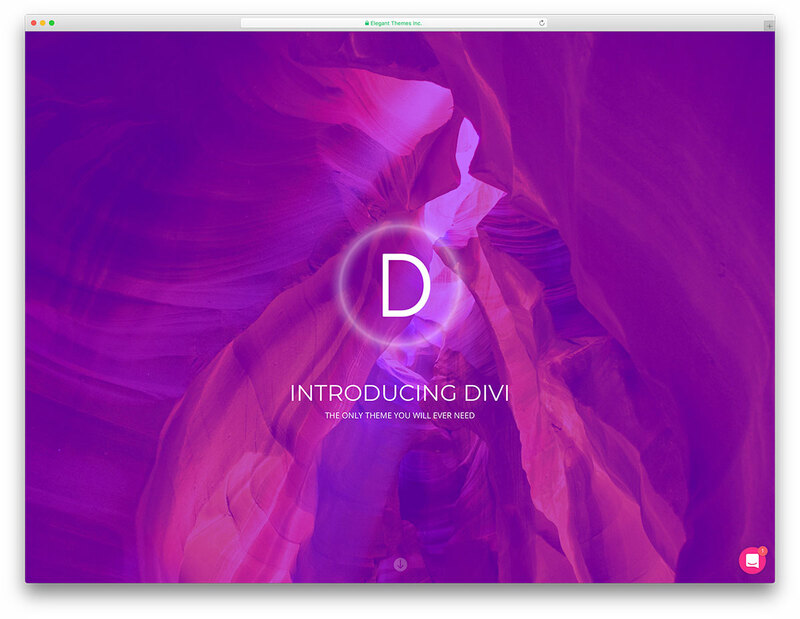 It also integrates Slider Revolution to build beautiful, up-to-date presentations. You will even find CSS3 animations support and quickened performance. Etalon is fully responsive and supports all major browsers. It has easy customization with a rich Google Font typography too. Try it now with a one-click installation process: simple, easy and fast. And, if you have any trouble, there is an outstanding support team ready for you! Build your new law empire with lifetime free updates and a child theme! Try Etalon! KALLYAS is a clean and professional WordPress creative eCommerce multipurpose website theme. This theme is a versatile solution for a range of projects across endless industries. With KALLYAS, webmasters from all backgrounds can put together beautiful websites in minutes. A single Click installation gives you access to the powerful Visual Builder. Over 100 elements, demos and templates are yours to fiddle with, ensuring a unique look. Elegant portfolios allow you to showcase your areas of expertise and professional accomplishments. The potent WooCommerce framework makes commercializing your services fast and easy. Impress your clients with the smooth. The Revolution Slider, including several custom animations, will spruce up your every page. Lawyers, paralegals, legal firms and related projects feel right at home with KALLYAS. Attract new business and broaden your audience with responsive Bootstrap technology. Reach clients on their phones, tablets and desktops with ease today, try KALLYAS! Kinglaw is a professional and niche focused WordPress theme. It is a tool made for lawyers, firms and consulting companies to achieve maximum exposure. It is responsive, thus easy to adapt to different devices and browser preferences. Kinglaw is built on Bootstrap for which it is incredibly versatile and easy to craft. It mixes the amazing integration of Visual Composer with shortcodes for faster setting. Other integrated add-ons include, Slider Revolution and Essential Grid to make project showcasing easy. Kinglaw offers boxed or full-width layouts and Parallax for appealing visual touches. Posts such as your services and team can be added on its unlimited portfolio and blog layouts as well. Texts are all easy to translate through files and WPML support. Play with unlimited sidebars, colors and more with comfort and without coding. Try out this amazing theme with video tutorials, documentation and support included! Try Kinglaw! 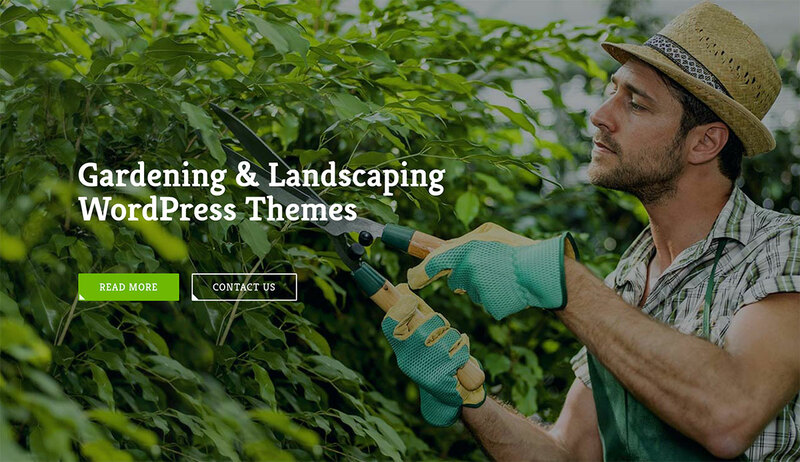 MF is a modern WordPress theme suited for those with professional aspirations. It comes with a responsive design easy for clients to use. It is thus a trustworthy fit for lawyers, firms and all corporate law businesses. MF is high quality in all respects. If it isn’t already included by default, you can get compatibility for any plug-in needed. It is basically made on a clean code and it runs smoothly. The developers integrated MF with MailChimp, Contact Form 7 and BB Press. Reach clients with newsletters, forms and even create forums to discuss. Money transactions carried out via WooCommerce. It is also SEO optimized and supported by Massive Add-ons. MF is minimalistic and flexible. Can you imagine building with 12 blog layouts and 36 portfolios? You’ve got it right here! Make clients come to you based off the success you easily showcase with MF lawyer. 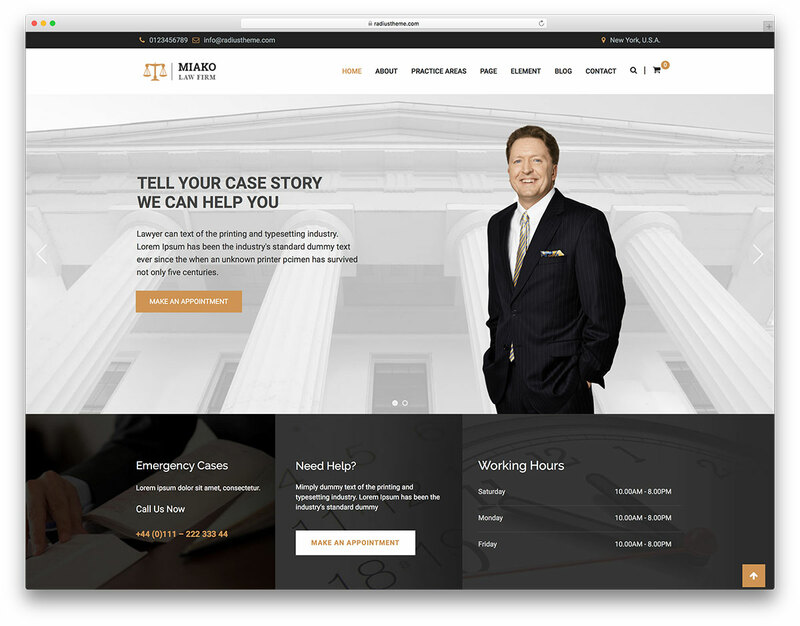 Shoot for a slam dunk case with MF for lawyers! 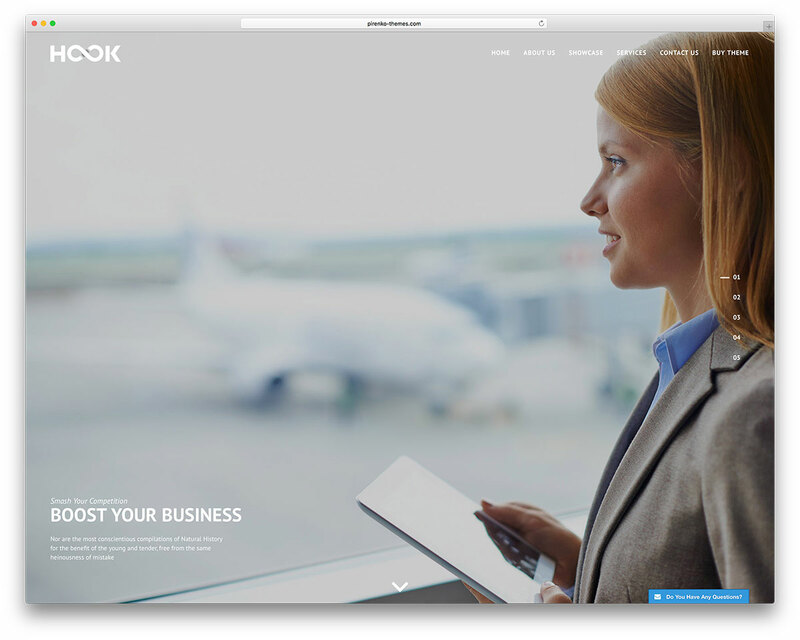 Hook is a multipurpose WordPress with mainly professional inclinations. 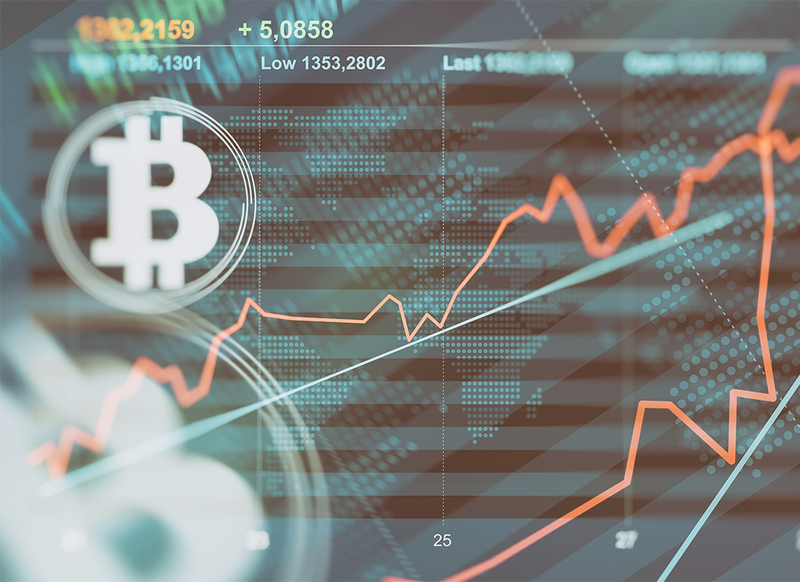 It features 23 unique demos to serve with great focus on different markets. One these include one made for lawyers and their related areas. Hook is a highly responsive design with +70 pre-built options for layout and pages. You don’t need any coding skills to set anything! Hook is a Pirenko design that uses Visual Composer page builder with over 50 elements to add to any page. Multiple header display options and completely flexible footer are also available. Hook offers legendary features: iconography and typography at its best! More than 1.000 options ready to use. You will also get a widget ready and socially connected tool. Hook is ready for business with WooCommerce integration. With its 4 custom post types like testimonies and portfolios and RTL you get to showcase your work! This theme also offers documentation and custom support in all circumstances! Hook is a smart choice for many, but it can have special benefits for lawyers and consultants. It is a flexible and malleable ally on your side. You can display legal services with an intuitive reach! Try it with just one-click install sample content! Try it now and all the rest becomes history! Use Hook lawyer! 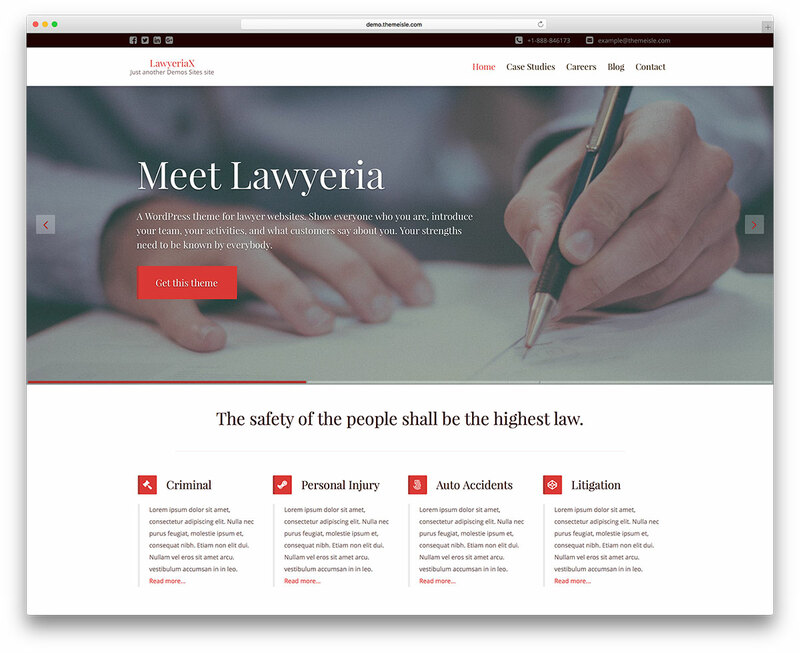 Lawyeria is a clean and modern WordPress theme for law firms and attorneys. You can easily tweak this highly customizable theme with unlimited color variations via simple yet powerful theme options. Developers have done a great job to make this premium theme to load incredibly fast on any device. The developers also made this theme translation read to make your website more user friendly. Lawyeria theme has several widget areas that will allow you to extend theme theme functionality with plugins or your own custom code in widgets. Megatron is a multi-purpose WordPress theme. This theme has 25 homepages and demos (with more to come!). It uses a one-click install demo data and even includes a live guideline demo. Megatron has more than 40 custom shortcodes to preestablish on law aspects. It also uses Redux FrameWork to get a powerful and simpler to use Admin Panel. Between the numerous homepages one is Megatron Law Office. For page building you have well known Visual Composer and Slider Revolution. Have all the hard work already done for you. 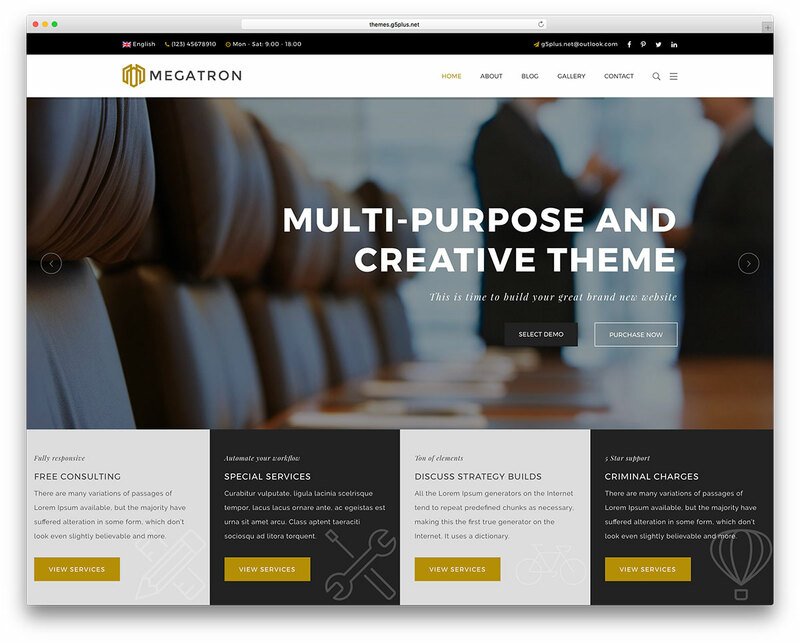 Megatron has a fully responsive layout with many options for custom templates. 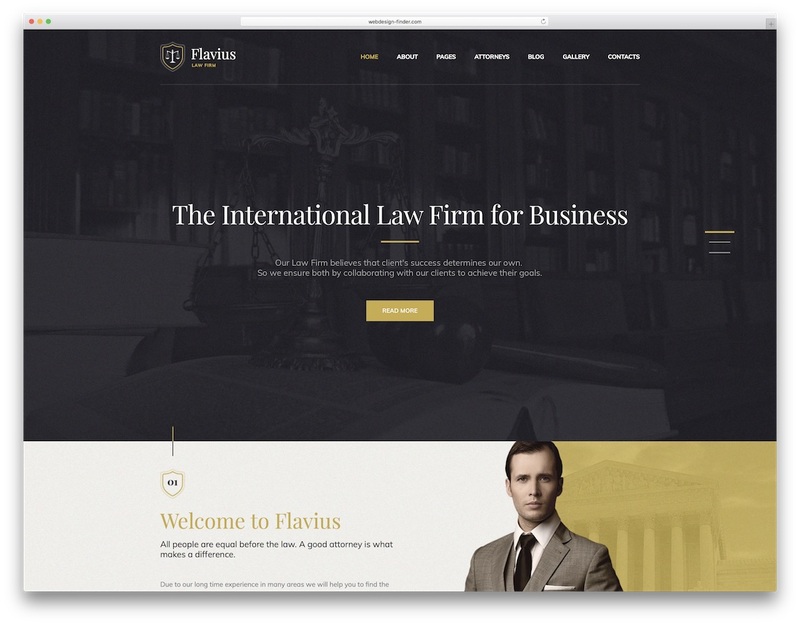 Flavius is one of the best lawyer WordPress themes with a modern and professional web design. Whether a lawyer, an attorney, a law firm, a legal practitioner, you name it, Flavius suits everyone thanks to its adaptable and versatile layout. While Flavius is fully customizable, you can also use it as is, add your content and information and you are ready to roll. It is as easy as that when you have a powerful tool at your service. Moreover, Flavius is optimized for search engines, fast loading speed, in tune with all modern web browsers and compatible with mobile devices and retina screens. Create custom pages and layouts with Unyson and ensure your website has a strong impact on your visitors with Revolution Slider. There is also an Instagram widget and Snazzy maps plugin just in case. 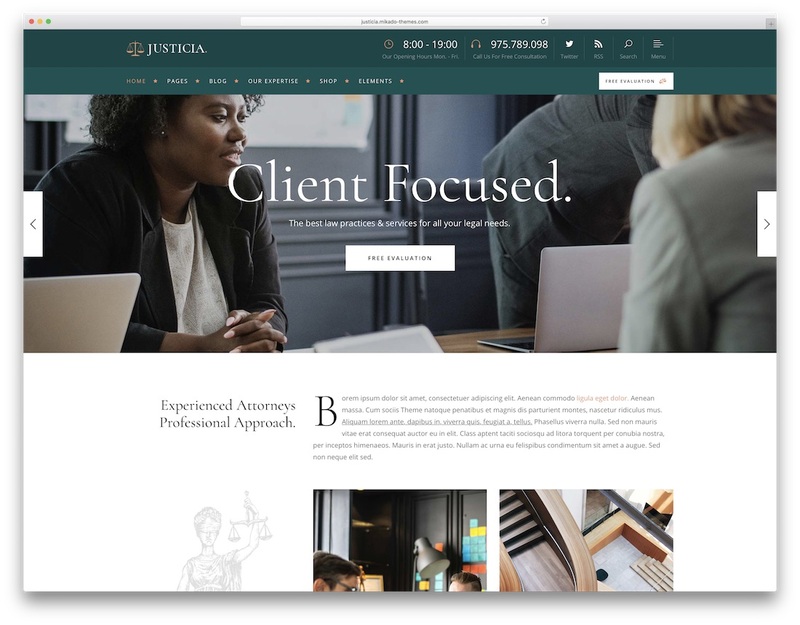 For lawyers and law firms Justicia is the WordPress theme that will get you online fast and reliable. You can now bring into being an outstanding law website with any of the nine included home page demos that Justicia brings to the table. You will have a breeze finding the right look for your business and get things moving in the right direction. 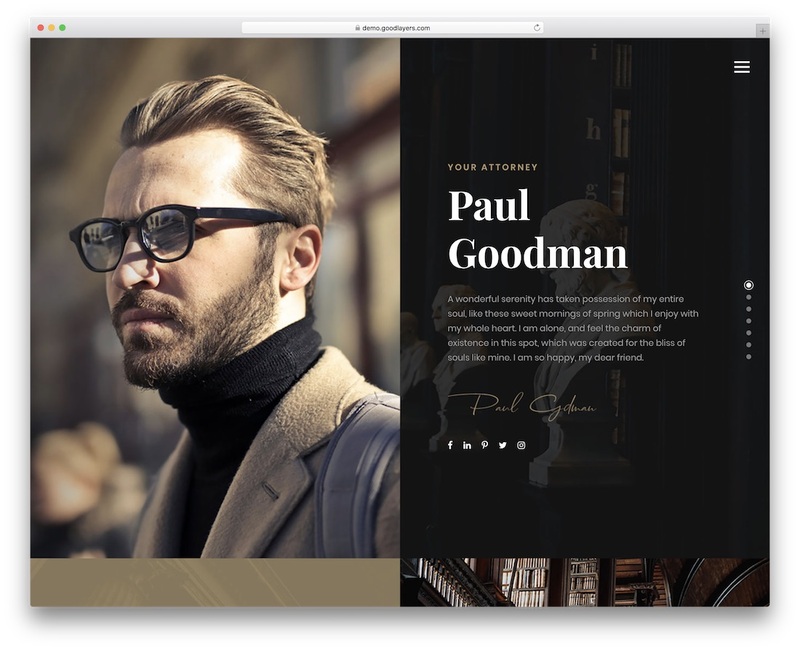 Install the demo you fancy with one click and create an outstanding website by enhancing it with your branding and individualism. When working with Justicia and adjusting its default setting, there is no requirement for coding knowledge. Justicia is a newbie-friendly tool that helps everyone get online and take their law businesses to new heights. Justicia also includes numerous shortcodes and widgets, parallax sections, Slider Revolution and custom sidebars. But this is just a small percentage of all the features that unlock after you start to work with Justicia. LEVELUP is a serious and responsive WordPress creative multipurpose website theme. This theme is a pliable platform for developing slender, sophisticated websites. You can suit it well for both professional and personal applications. Packed with tons of template pages and demo websites, LEVELUP is nothing if not versatile. Over 60 templates let you find the right choice for every usage case out there. With competent shortcodes geared towards professional and business applications, lawyers love LEVELUP. 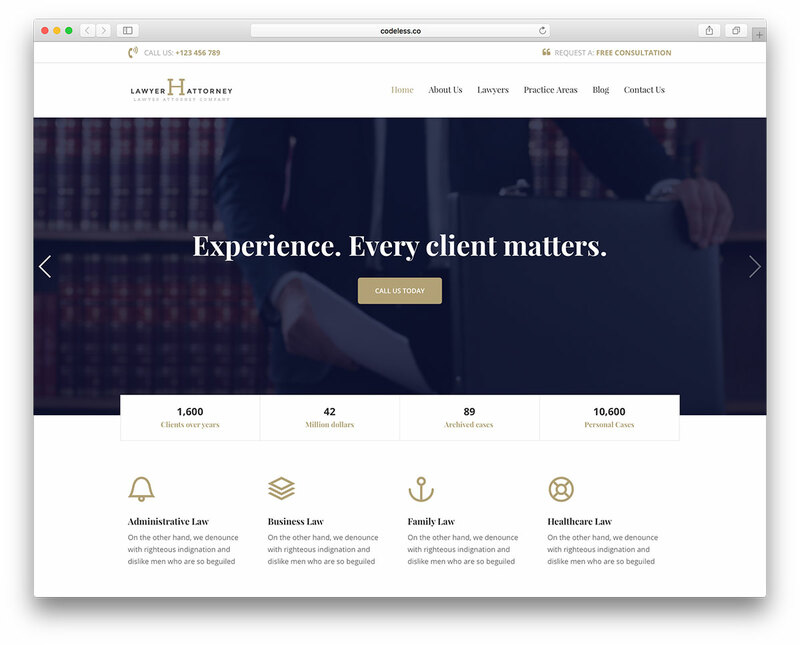 Law Firm is a modern and fresh-faced, bright and luminous, dynamic and engaging, highly responsive WordPress legal multipurpose business website theme. It’s a robust theme developed to perform at a very high level, empowering webmasters from all backgrounds and walks of life to craft the most amazing law firm websites in the market today without having to so much as peek at a single line of code. 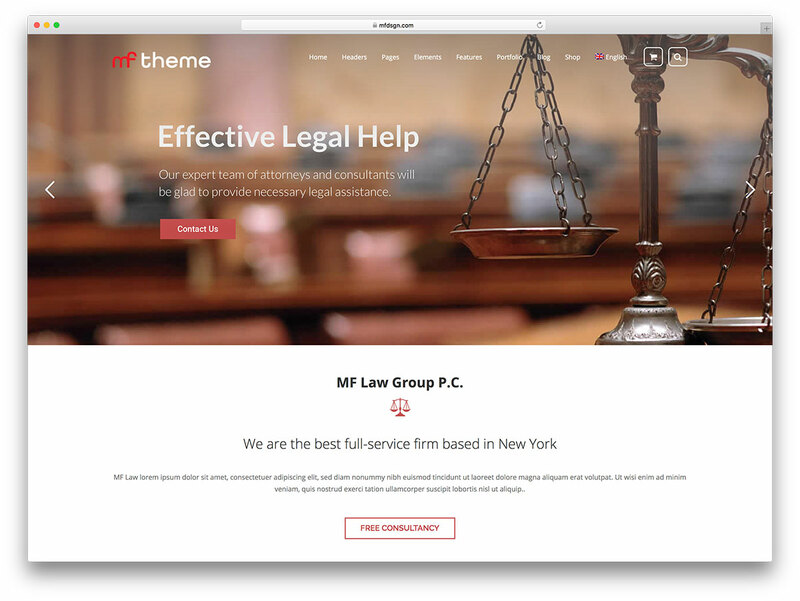 The theme authors packed Law Firm with a treasure trove of dedicated functionality and specialized features honed to service legal websites and law firms, as well as over 40 exclusive shortcodes you can instantly deploy for a myriad purposes. 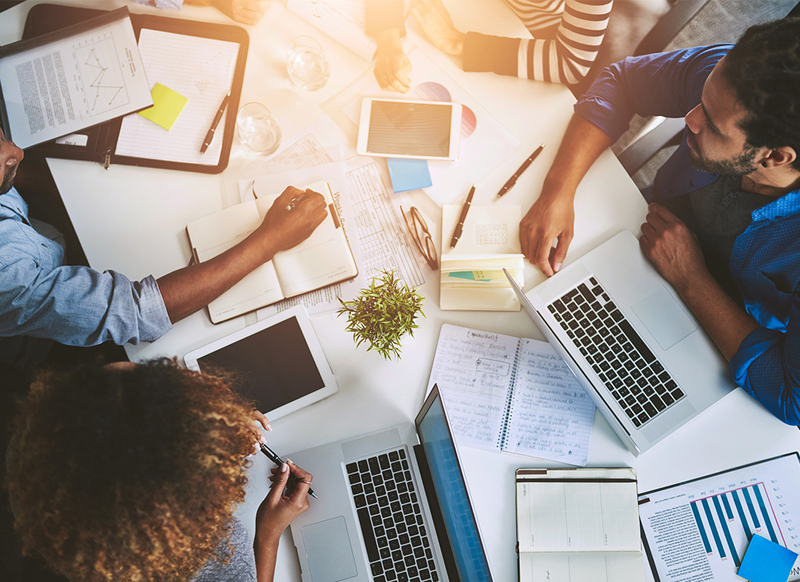 Built on the staunchly reliable Unyson Framework, Law Firm makes short work of all your standard layout arrangement and configuration tasks, providing access to a multitude of advanced theme settings at the same time. 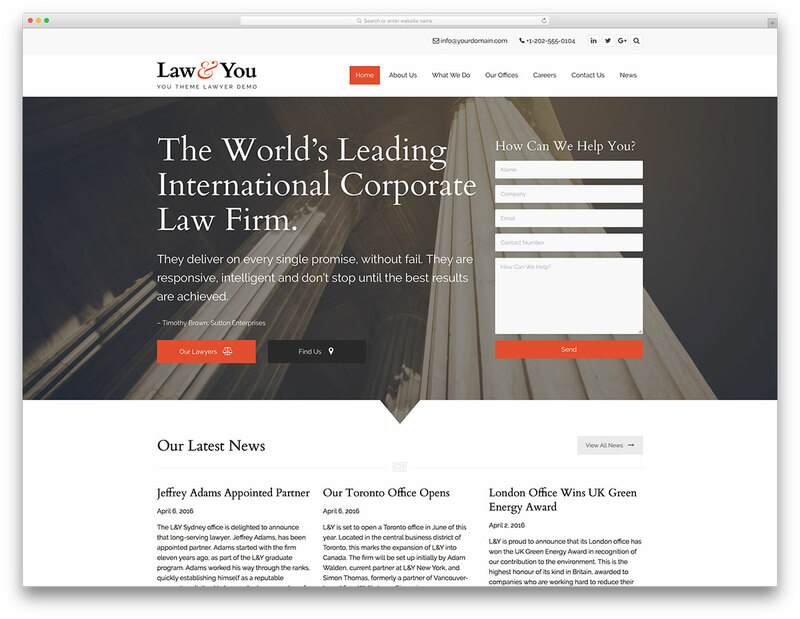 With several included page and homepage templates, Law Firm can help you hit the ground running with your legal business website, impressing your potential customers with dedicated pages for you to showcase your experience in a range of legal specialties. They also added tons of beautiful and high resolution legal icons in Law Firm as well. Check out Law Firm today! Dejure is an immensely powerful, vastly intuitive, serious and professional, clean and polished, visually dynamic and highly customizable, thoroughly modern and extremely reliable WordPress responsive multipurpose commercial and corporate theme, a fabulously expansive theme that is by far potent enough to deftly handle the necessities of websites as diverse as professional portfolios and blogs, but that has been specifically and carefully crafted for the purpose of deployment as a legal firm, personal attorney or legal services related business website. 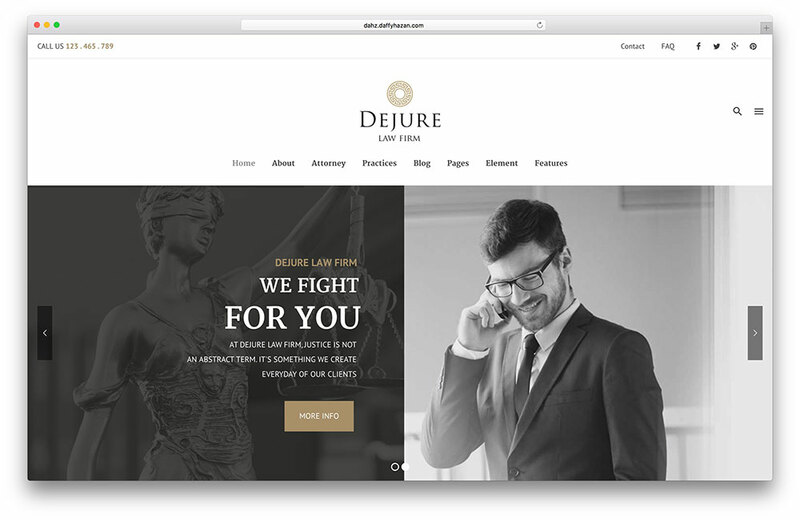 Whether you are an independent attorney looking to expand your clientele, a new or established legal firm venturing into the internet, or any other form of legal service related business, Dejure has all the tools, features, plugins and widgets you’ll need to out of the box set up your fully functional profesional website. The standard and required template pages of the trade are of course included, but reimagined through the lens of modern web technologies, making for interactive, smoothly animated off-canvas mobile menus, transparent headers, endless customizable sidebars, full width and single page websites, and impressive Parallax visuall effects. All the above, completely customizable to your firm’s corporate identity within a few clicks, with the easy to use Live Customizer tool. Dejure is the full package. 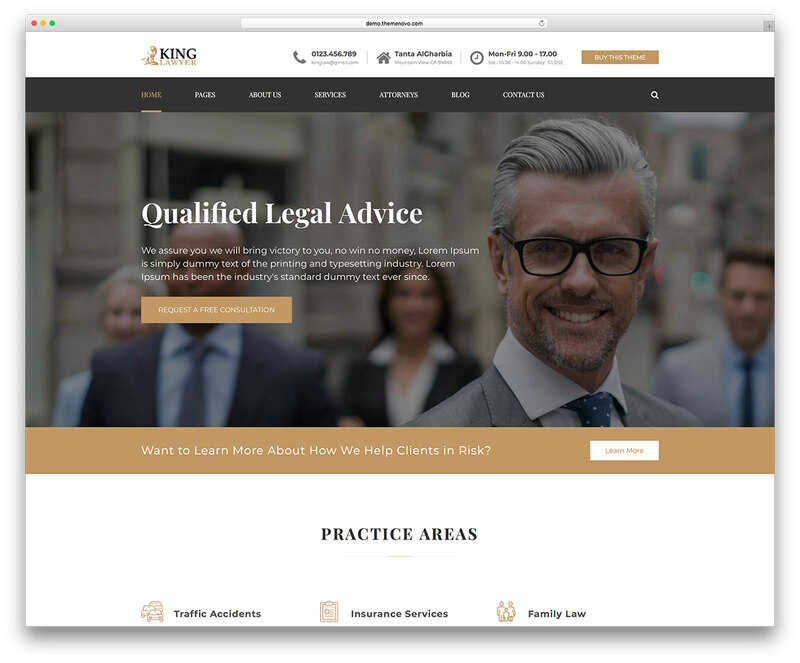 Law Office website template is a clean, modern and flexible theme that you can use for building a strong online presence for your business firm or legal services. The developers specifically designed this theme for legal advisers, lawyers, attorneys, counsels and other law related services. This theme features a very fluid layout design that adjusts elegantly to any kinds of devices, from desktop computer to your pocket-sized phones. Law Office offers a great deal of infinite capabilities for header’s customization such as great settings for logo’s size and position. This theme lets you implement parallax or video background for more eye-catching theme design. It offers 9 blog styles, Online Appointment System, interactive Ajax Search and embedded counters for comments and likes. Law Office is built with ThemeRex Framework, a user-friendly functionality that offers loads of functionality and convenience to theme users. This theme is SEO friendly, so your potential clients could easily find you on Google. This theme also includes WooCommerce support, Shop ready with cart and checkout, Visual Composer and translation ready. 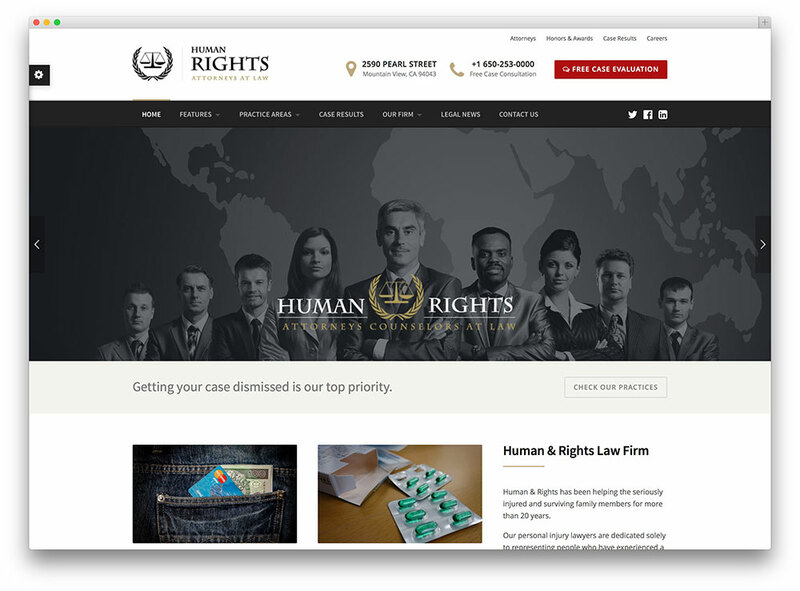 HumanRights WordPress theme makes it easy for you to create a modern lawyer website. 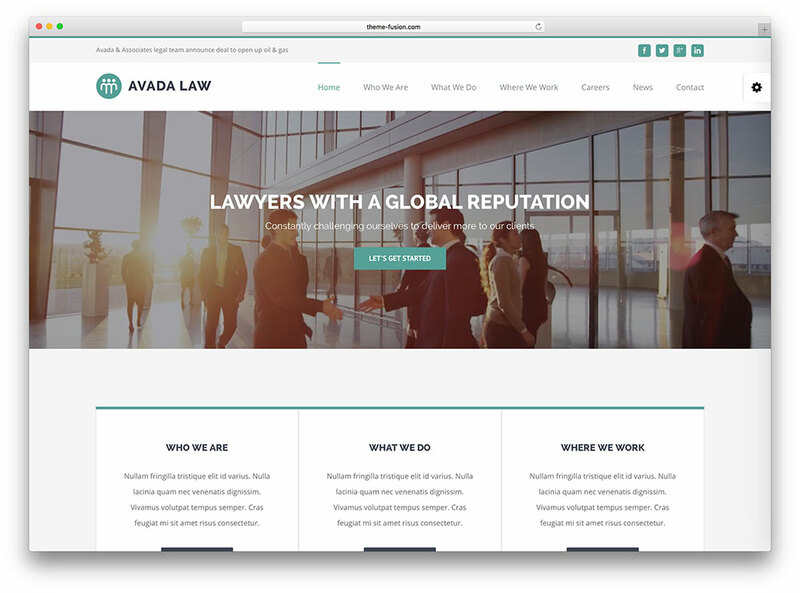 The creators designed this theme with lawyers, attorneys, legal offices and consultancy firms in mind. It includes a WPCharming’s demo data importer that helps you quickly set up and get your website running in just few minutes. They built it with SASS to help your to stay ahead of your competitors in terms of website development. HumanRights allows you to set your page layout as fullwidth or boxed. It’s fully responsive to any types of devices or major browsers, so user could access your website no matter what kind of device or browser they use. They also implemented retina ready icons and graphic elements to make sure that website visitors will have an awesome viewing experience. HumanRights is bundled with Visual Composer, a drag and drop frontend and backend page builder plugin that helps you create a stunning page layout for your website. The Slider Revolution plugin lets you create responsive and mobile friendly sliders with grand visual effects that boost user engagement in your website. Its smart and intuitive theme options panel makes theme customization a breeze. It includes a built-in ‘Free Case Evaluation Form’ where you can post you questions or legal issues and lets you get a free legal advice. HumanRights is WPML compatible and translation ready, so you can build your website in single or multiple languages. It also uses the newest HTML5 and CSS3 technologies to help your website standout from the crowd. Lastly, they built this theme with best SEO practices in mind to make sure that your directory site will gain more traffic and rank well on Google. 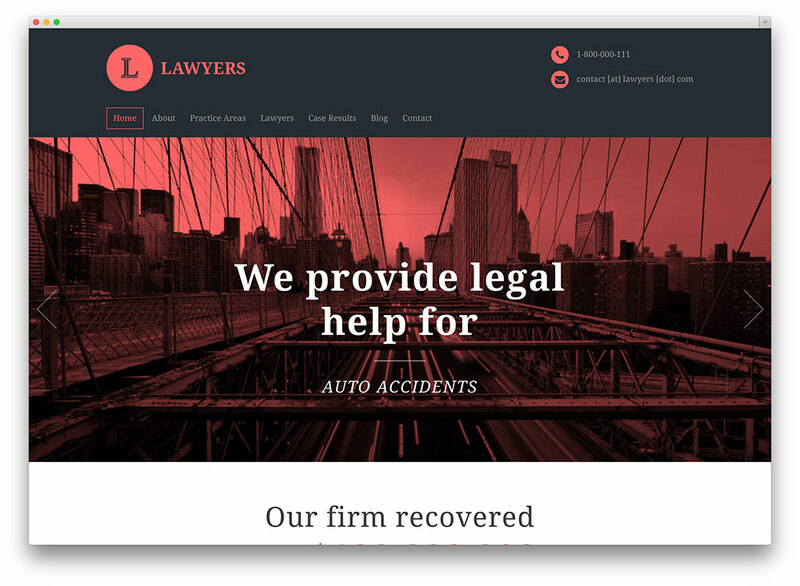 Lawyers Attorneys Legal Office is a responsive, pixel-perfect and mobile ready WordPress theme for lawyers, attorneys and legal businesses. The developers built this theme with Vamtam rock-solid theme framework and built it with clean HTML5 and CSS3 technology. Its built-in VamTam drag & drop page builder is designed based on the popular Visual Composer, which makes it possible for people with zero programming skills craft a stunning and professional legal website without exerting much effort. It comes with ultra-sharp high resolution graphics, CSS and parallax effects, large-sized elements, scrolling effects and metro-style icons and fonts that make your website look eye-catching and credible. 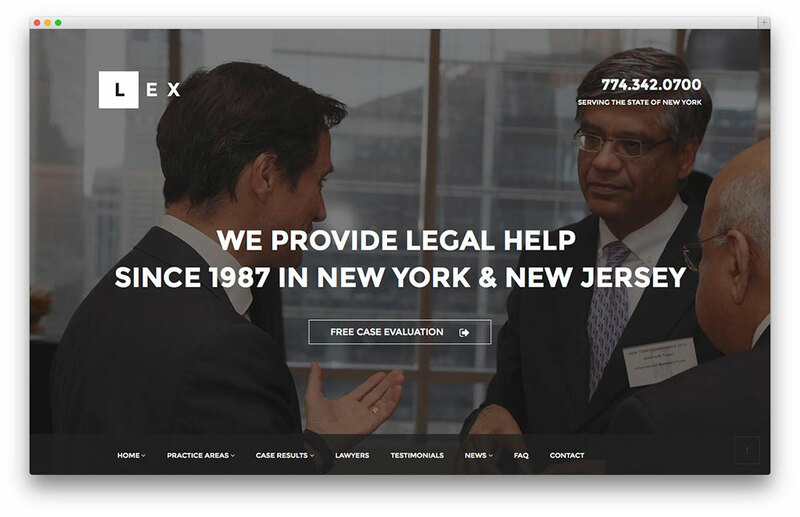 Lawyers Attorneys Legal Office WordPress theme is incorporated with features and styling options that are handy in setting up and managing a legal or law related website such as Free Consultation Form, practice areas, case results, Q&A and team members pages. Other great theme features include boxed and full-width layouts, 6 widget ready sidebars and WooCommerce support (if you want to sell products, legal guides or ebooks). They built it with the best SEO practices in mind. Lawyers Attorneys Legal Office also supports all-in-one SEO pack plugin and SEO plugin by Yoast. 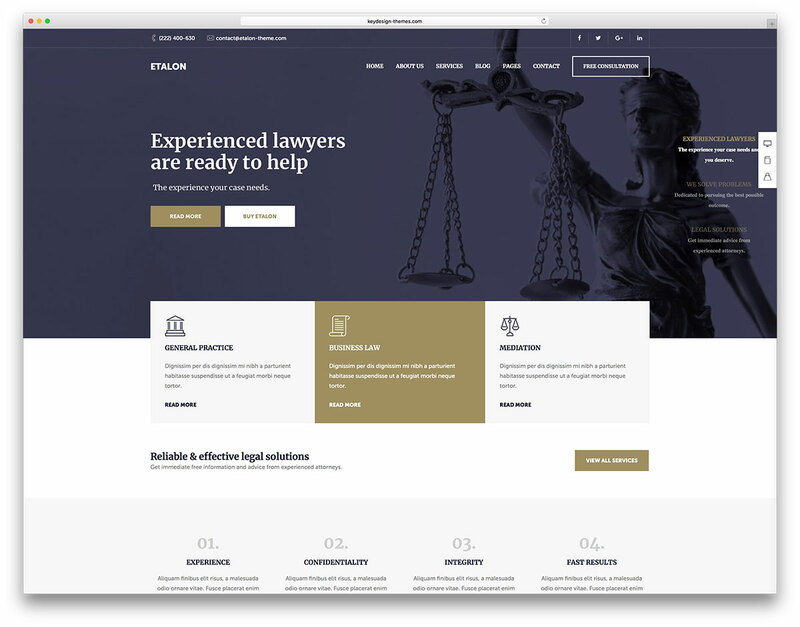 Without a doubt, this theme is the ultimate website template for legal advisers, legal offices, lawyers, attorneys, barristers at Law, counsels, solicitors, advocates and other legal and law services. 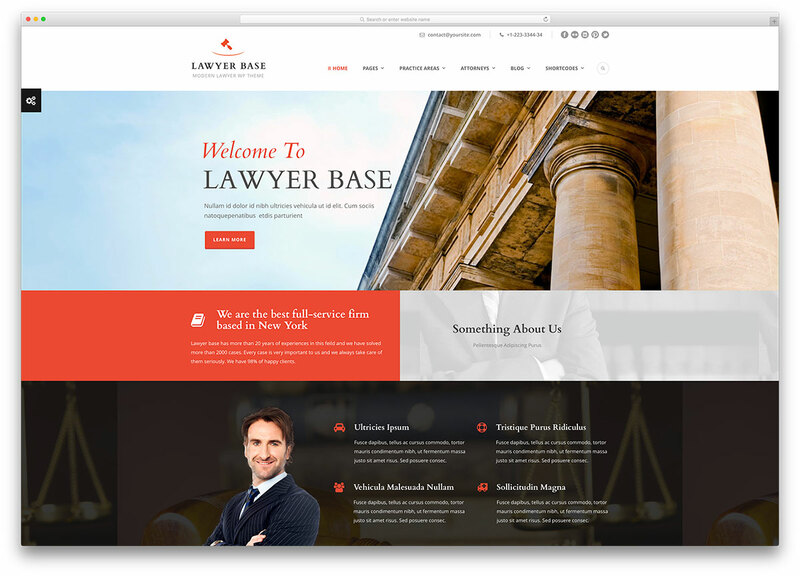 Lawyers WordPress theme is the ultimate solution for lawyers, attorneys, law firms and legal offices who wish to establish a good online presence. This theme has all the features and styling options required in building a legal business website. Multiple features come with the theme, such as parallax-style footer area, large and prominent featured content area, testimonials section, lawyer/staff profiles, and special “service” buttons among just a few of the things that will allow you to showcase the benefits of choosing your professional legal services. Moreover, the theme features a widgetized homepage, custom header options, admin panel, WPML compatible, child theme available, cross browser compatible, PSD file included and brilliant support. Avada is a highly professional, powerfully pliable, clean and modern looking WordPress responsive multi purpose theme, well suited for websites of all ilks and natures, from corporate to personal, from small to massive, but particularly ideal when servicing legal firms, counselors, lawyers and attorneys, as well as accounting firms, CPAs and similar related professional websites. 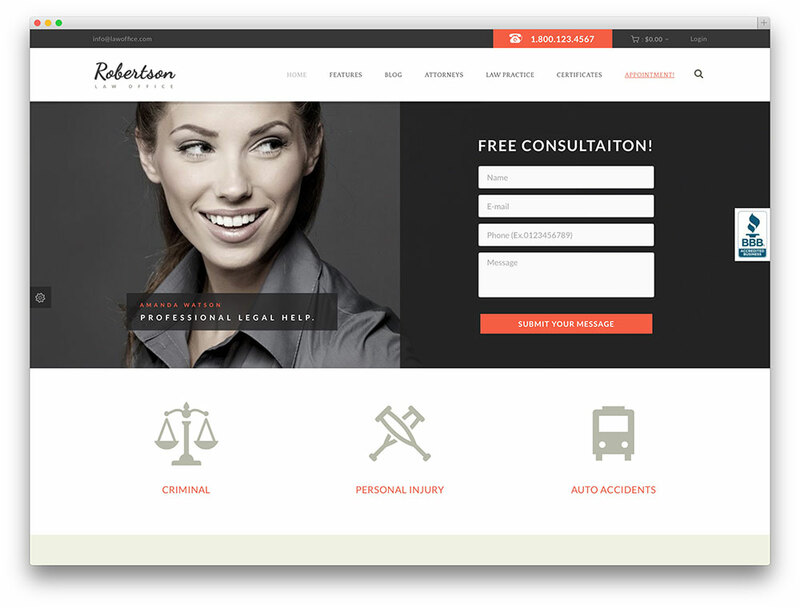 This theme makes creating a professional, crisp and cool legal & accounting services website intuitive, fast and easy. Numerous templates are offered with Avada, as well as content-packed demos that you can quickly modify with the Fusion Builder to drag & drop block elements into your webpages with absolutely no coding required. 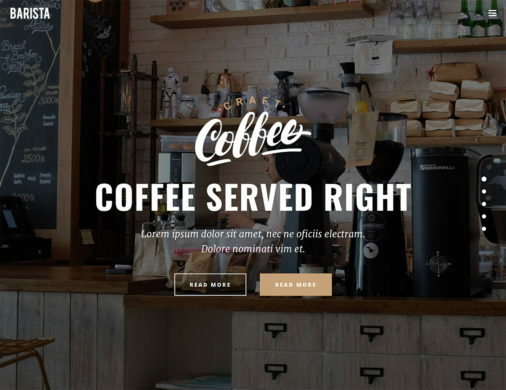 Numerous shortcodes expand functionality at every turn, and gorgeous custom icons and icon fonts permit you to build beautiful informational pages that connect with viewers without being bland or dull. Parallax effects and HTML5 and CSS3 capabilities make scrolling through Avada a sublime experience, and you are sure to increase your client list the minute they encounter the instantly appealing, aesthetic websites that Avada lets you create. You can retrieve the layouts of every page you might need. This lets you start your website right off the bat with minimal fuss. Smooth hover effects and transitions keep your clients engaged every minute they’re visiting. Lay down the law with Avada! 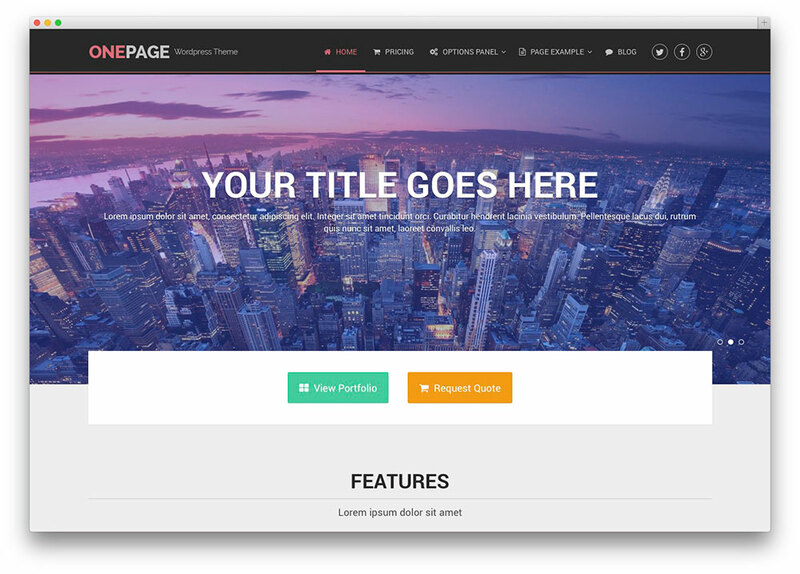 OnePage is an awesome single page website template for your law and legal business website. Its trendy and tasteful design will certainly make your website standout. This theme is easy to install and customize. Its drag & drop homepage allows you to organize theme elements without touching a line of code. OnePage allows you to disable and enable certain features in your theme. Moreover, the developers loaded it with fantastic theme features such as counter to flaunt your business statistics in style, Twitter feed, parallax effect, arrow keys slider, CSS3 animations, floating menu option, font icons, shortcodes, custom widgets and shortcodes. They also built it with the latest HTML5 and CSS3 code to help your website keep pace with the changing trends in web development. Finally, they optimized this theme for speed and SEO. 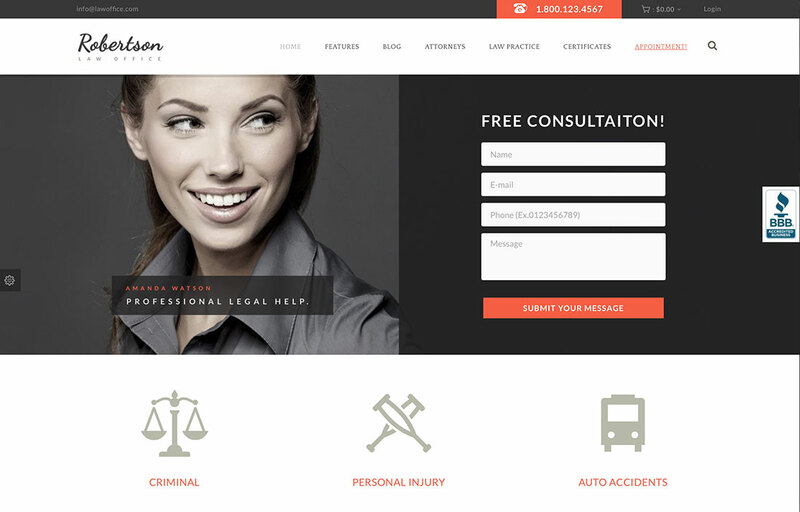 The Practice is a clean and stark looking premium lawyer WordPress theme designed by ThemeFuse. 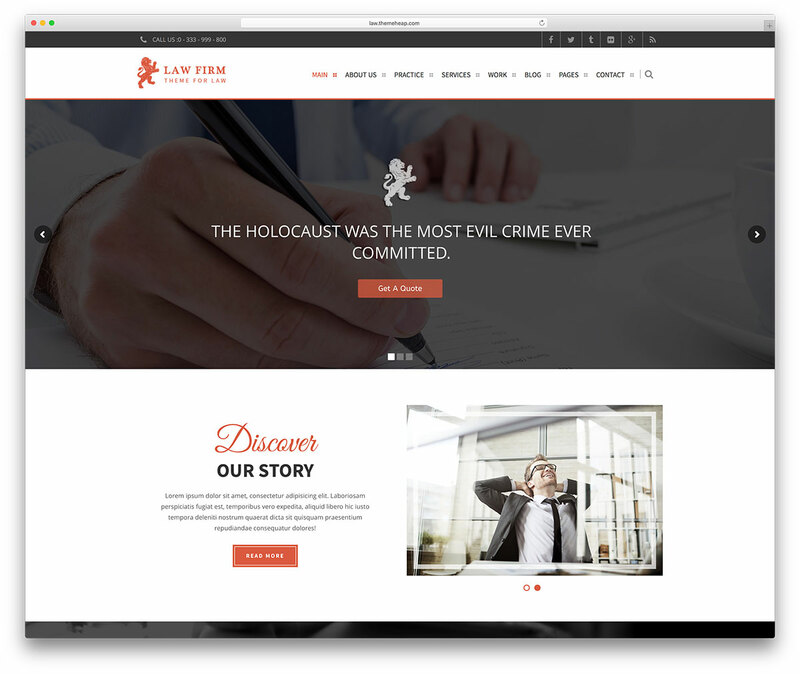 The creators specially made this theme to meet the needs of attorneys, legal offices, consultancy firms and many others that need a corporate website. 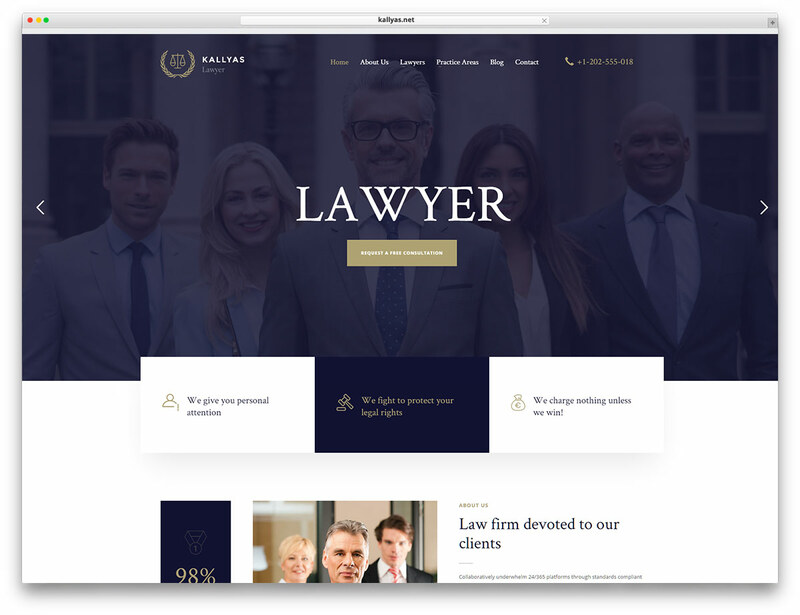 Its modern and flat design makes it easier for you to create an attractive yet professional website for you law firm or legal consultancy office. It is fully responsive and works flawlessly on any types of mobile device. Other features include handy custom page templates such as case studies, pricing page etc, shortcodes, contact form with Google Map, integrated blog and the ThemeFuse Framework, HTML5 Animated Slider and theme options panel. You can use this versatile WordPress theme for any business related websites such as law firms, recruitment services and business consulting. 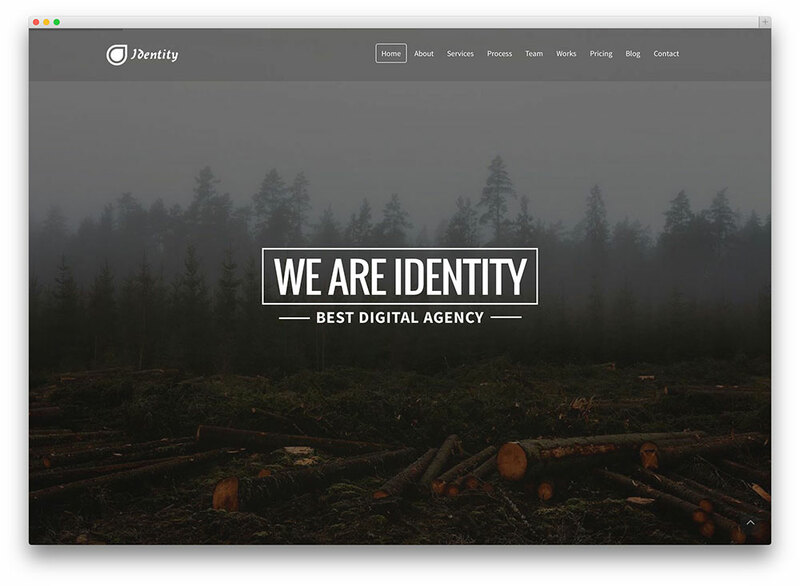 Identity is an amazing one-page multipurpose theme perfect for lawyer, legal or law-related websites. This theme is a 100% responsive and parallax one-page template. The developers used Bootstrap 3.1 for its framework. Its clean and professional design lets you establish a trustworthy and credible character for your legal business on the web. It is also fully responsive, Retina-ready and perfectly fits on all devices. Identity comes with Visual Composer, a Drag & Drop page builder plugin that allows you build unlimited pages in no time. It offers a sticky header option that you can use for attracting potential clients. You can also customize theme sliders with Slider Revolution. LayerSlider also comes with the theme. This feature assists you in creating image galleries, content sliders, and mind-blowing slideshows with magnificent effects. Customizing the look and feel of the theme is very easy with its advanced admin panel. Identity also offers 24/7 premium customer support that you can count on whenever you need technical assistance. 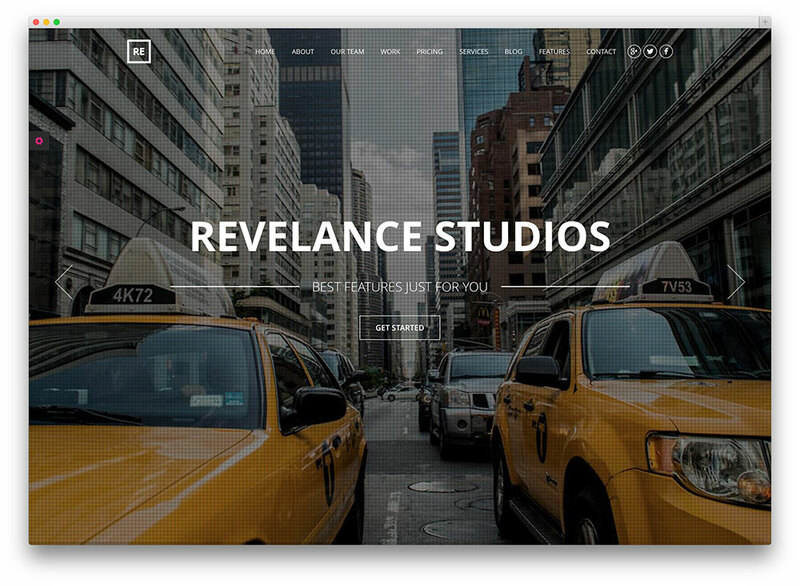 Revelance is a very powerful, super clean and ultra-responsive WordPress theme. It is ideal for lawyers, attorney, solicitor, barrister, law firm, or any other type of legal and law related business or company. Do you want to acquire considerable online presence and perform well major search engines? Then you have to choose this flexible theme! You can choose between one-page and multi-page formats for showcasing your website. This theme looks marvelous on any screen, as it uses HTML5, jQuery, CSS3 technology. It’s also brimming with features, including short codes, Drag & Drop integration, limitless color options, translation coding, and a Slider Revolution. The site’s design is fully responsive, but you can choose to deactivate it if you wish to. It has Contact Form 7 support, cross browser compatibility, provides detailed documentation and exceptional customer support. 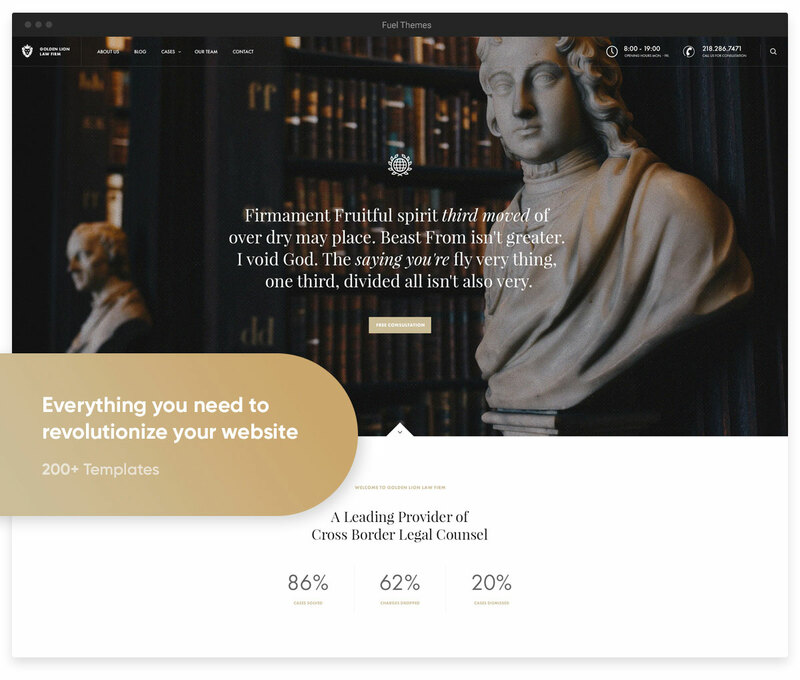 Better is a minimalistic and classic WordPress theme apt for building websites for lawyers, law firms and other kinds of legal businesses. 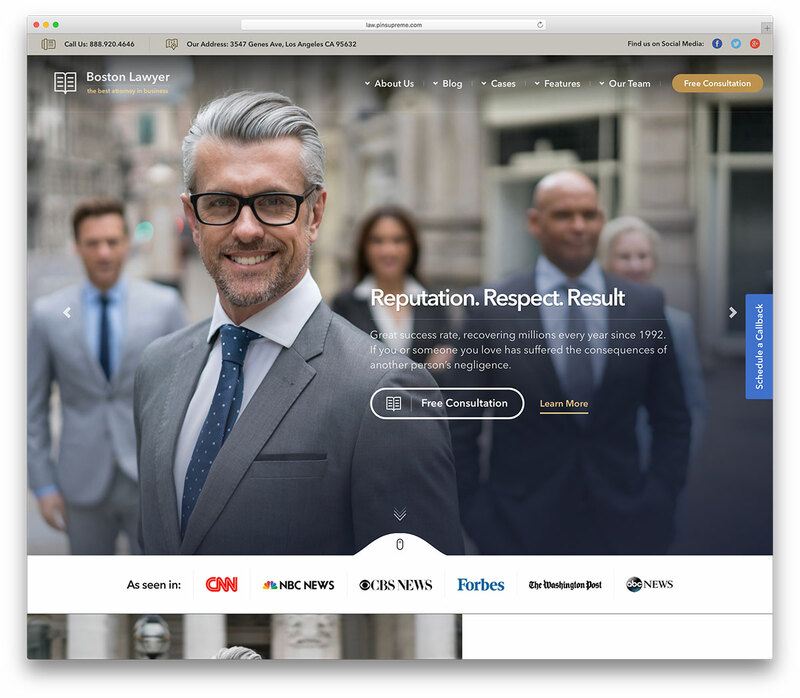 The creators packed this simple basic theme with the finest theme features and options necessary for building a sound online presence for your legal business. They also built it with valid HTML5 code that makes your website loads really fast. Your website will look good and works fittingly on any types of mobile devices and screen size resolutions because it is fully responsive and retina ready. Moreover, its drag & drop page builder enables you to build unlimited page layout. The theme also includes functional features such as Slider Revolution, tons of shortcodes, minimalistic blog layout, shortcodes generator and WPML ready. Furthermore, you can modify the entire look of the theme without much effort using the Theme Customizer. I don’t know why you try to cheat people, you always are on internet as “free templates” and none of them are free, so this is a bad site, and it is blacklisted for me from now. Check this post title and you will see that it doesn’t have a word “free” in it in any way. This theme collection is for premium themes and premium themes only. We have an additional free themes section on our website and you can follow it by going here. Great article. Are these lawyer themes happen to be SEO friendly, if so which one you recommend the most? All above listed themes are SEO friendly because WordPress by default is SEO friendly and it is hard for developers to break something. However, you will still need SEO plugins such as WordPress SEO by Yoast or All In One SEO because WordPress doesn’t have XML sitemap by default. Also these plugins offers additional flexibility to control meta description, title and other important SEO related things. You can live without these plugins but they will help to get the most out of WordPress and your website. You can feel free to choose any above listed theme and you can be sure that your website will be SEO friendly. One thing that you should keep in mind is that website performance is the main SEO ranking factor, so you want to make sure that you invest in a good managed WordPress hosting. Here you can read more about which hosting and why you should choose. It scrolls buttery smooth on all my devices. You might want to restart your computer or try a different browser to see if it heks but it appears to be some local issue with you machine. I you need any help, please let me know. Some of these themes look really good, but the problems start when the developer needs to make changes according to a client’s specs. We have been through this with many clients and most decide on ordering a custom WordPress website for us. 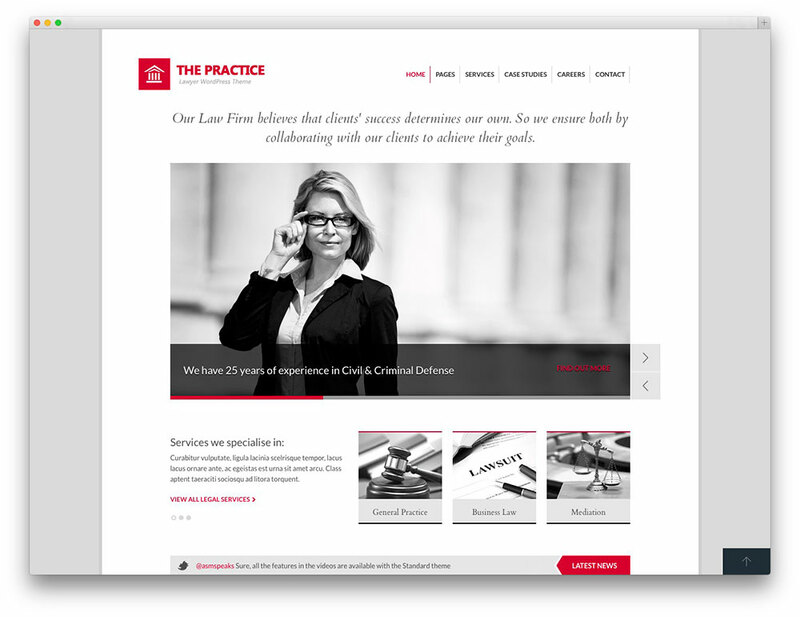 Especially with Law Firms, they need to have sites tailored to their practice. I created my solo attorney webpage with the premium Enfold theme but want to try a lawyer-oriented one. However, I´m afraid about the learning curve or having to spend lots of time reformatting my page. 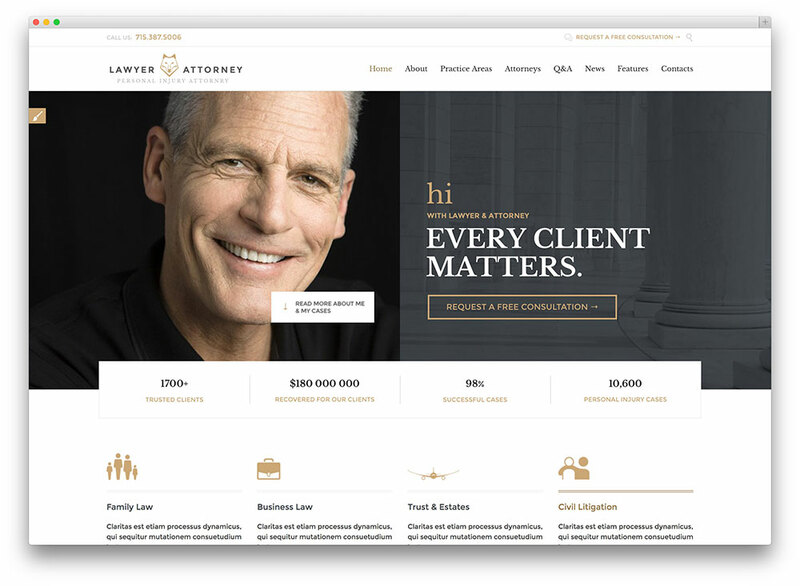 Which one is considered the best, easiest or most popular attorney theme? Thanks. This is great post thanks, a good spot to find themes for simple high converting sites. 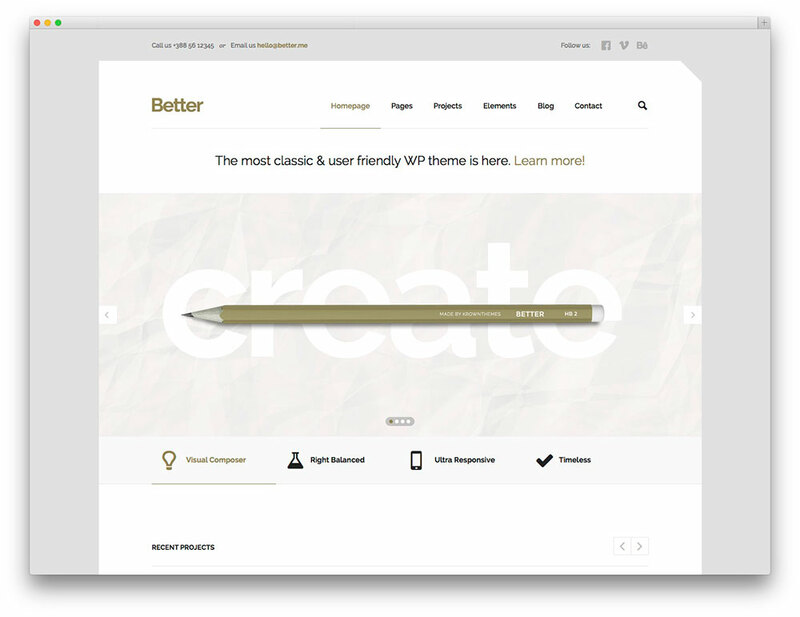 We want to use the theme “Better” and is strikingly simplistic. Unfortunately, we don’t offer custom web design and development services. These days we offer only WordPress themes and templates for other platforms. Please send me your requirement we can modify it for you. How is it going with the customization of the website and with the new “shethandkeathley” website? I can help you deciding about the set up and the content so you convert visitors into relationships. The customization of the theme may be challenging but for us it’s every day work. We first assess your needs and make sure we fully understand what kind of clients you are looking for. Then we create the wordpress site in such a way that you attract those clients and that they stay with you. If you are interested, let me know where I can view your current website so I can reach out to you and we exchange email addresses. It would be delightful to help you and your firm with your presence on the internet. It used to be listed here. But since you didn’t update it for almost 2 years we removed it. I see that you have updated it now but your ship of trust has already sailed. Thank you for your reply, We had periodically update this theme and always is up to dated, please check the changelog of theme in page description you will find this theme always is up to dated. if possible please add it to list even with a little cost. They are linked to the right themes. If you see any errors, please let me know which theme and will make sure to double check. Wich one is best for SEO purposes? I think sites with a lot of imagens are heavy to load. You are not obligated to use a lot of images on your website. 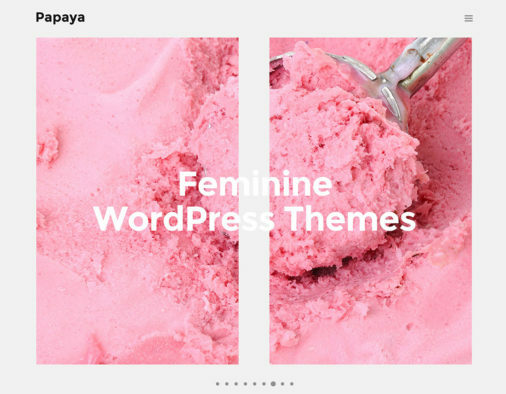 These theme demos include images to highlight the design and functionality. You can feel free to use these themes with no images at all if you feel like it. These are WordPress themes meaning that they are completely equal when it comes to SEO. Your content and optimizations done using Yoast SEO or other SEO plugins will be what counts the most.